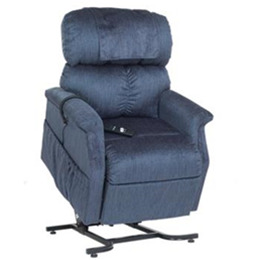 The Comforter PR-501T is an altered model of Golden's best selling and best all-around performing lift chair made especially for taller users. It combines a tried and true three-position lift mechanism with ultra-plush seat and back pillows, a reinforced hardwood frame, and a removable back. Every Comforter also comes with a 7-year pro-rated warranty and can be ordered with premium Ultra Fabrics.